"Your missing teeth will remind you of my victory." Much of Cammy's past is unknown. Her earliest known activities were as a Shadowlaw assassin. She had clearly been brainwashed, and was completely under M. Bison's control. Carrying out hits with brutal efficiency, she nonetheless had a vague feeling that what she was doing was wrong. These feelings had increased by the time she was 16, when she was assigned to assasinate a government official in England. Cammy's brainwashing had been incomplete, and she had managed to overcome her programming. A confused Cammy did not complete the assignment, and did not report back to base. 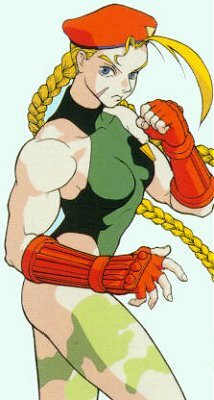 Vega, Bison's top assassin, was assigned to eliminate Cammy because she was a threat to the organization. He tracked her down and brutally attacked her. Normally, Cammy would have been ready for a confrontation such as this, but she was disoriented and quickly lost. Left by Vega to die, she was found by an unknown individual and and was left on the doorstep of Britian's Secret Service building. The explosion of the Shadowlaw base caused Cammy to lose her memory. The secret service agents did not know who she was, but they knew she possessed excellent fighting skills. The amnesiac Cammy was able to make a new start because no one (including herself) had any idea about her past. She was trained to be a special agent and amazed her superiors with her skill. She quickly earned a spot in the elite Delta Red Squadron, and was sent on many secret missions. Three years passed since Cammy joined the Secret Service. The British government had been tracking the movements of Shadowlaw, which had thought to have been destroyed but was regaining it's strength in Asia. An agent named Eagle had been sent to the first Street Fighter tournament years before, but had not been able to prove that Shadowlaw had anything to do with it. Now, Bison himself was hosting a second tournament, and it was decided that another agent needed to be sent in. Cammy was the obvious choice, and joined the tournament as a late entry. Although she participated in the tournament, she spent most of her time snooping around Shadowlaw headquarters to find a way in. Luck was on her side one day when she met Thunderhawk. He was a latecomer to the tournament too, and he was seeking revenge on Bison for the loss of his tribe's reservation. The two of them pooled their knowledge and found a way in. The two of them encountered Bison inside, and she confronted Bison about her past. He revealed to her surprise that they had been lovers, and in disbelief she attacked Bison. Bison's bodyguard Vega attacked Cammy, and she barely escaped with the help of Chun-Li. A youth named Ryu defeated Bison to win the tournament, and Bison was believed to have been killed by a mysterious warrior after the tournament was over. Shadowlaw crumbled once again, but Cammy felt no victory. When the other Delta Red members came to Thailand to pick her up, she revealed what she had learned of her past to them. Her comrades understood her pain and assured her that she was not the person she had been before, and that they were proud to serve with her. Touched by her friends' compassion, she decided to stay with MI-6 and returned to Britain finally free of her past.